Also known as a generator set, a genset is a combination of equipment that converts a direct source of heat into electrical energy. In most cases, it’s used to refer to the combination of an electrical generator and an engine that are combined to create a single source of power. 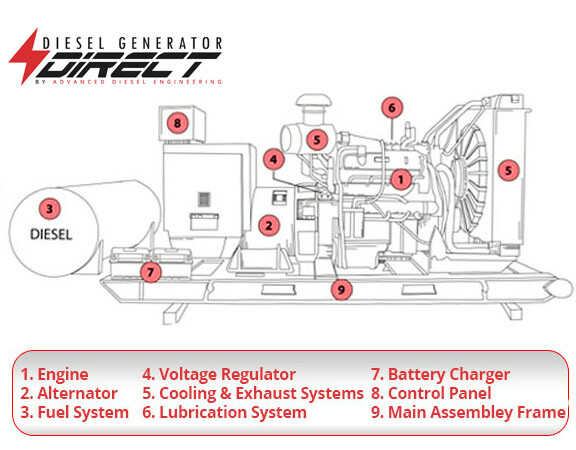 What is a Genset used for? Primarily, gensets are used on sites that aren’t connected to the power grid, acting as a self-sufficient power supply. They may also be used as an emergency source of power when the connection to the grid fails. Finally, they can be used to produce power during peak hours. When your energy demands are at their highest, you can deploy a genset to reduce the costs of getting all your supply from a utility company. Which elements make up genset? A genset produces power through its engine and source of fuel. They can use a variety of fuel sources, including diesel, gasoline, biogas, natural gas, and more. The fuel is stored in a fuel tank, burned in the engine, and converted by a generator. When converted, energy is stored in a battery. The Automatic Transfer Switch help genset owners control when the genset starts to supply power while the control panel acts to monitor, regulate, and protect the genset. Other components include a soundproof cabin, often made of steel or aluminium. Treated with anti-corrosion elements, it keeps the airflow that cools the engine consistent and also reduces the amount of noise produced by the genset. Finally, the baseframe is a solid frame often made of steel that reduces vibrations that could cause damage to the genset and may be used to elevate the generator. Continuous load: When a genset is used as a primary source of power for sites that are off-the-grid. Often used in remote location applications like mining, construction, and on ships. In some cases, it is even cheaper to use a continuous load genset than to use power from a utility company. Backup generators: In the event of a power failure, the Automatic Transfer Switch can kick the genset into life to make sure that the site stays operational. Often used in hospitals, schools, and comms facilities where a power cut can may a major source of downtime or even a life-threatening risk. Peak shaving: When electricity demands are the highest, gensets can be used to provide some or all of the power required. Some companies even use peak shaving to negotiate lower rates from utility providers. Portable use: In some cases, smaller gensets can be used to provide portable power on a mobile site, like an RV or a boat. Portable use gensets tend to be smaller and have a lower output as a result. Finding the application you need need can be a crucial step in choosing the right genset for your business or site. Could you benefit from installing a genset? A genset can help provide the supply of power you need for your off-the-grid site or act as an emergency backup and even a cost-cutting measure. Finding the right fuel type, fuel capacity, and arrangement depends on your exact needs, but there is no denying the utility and versatility of such a device on your site.